Tough power 1000 Thermaltake casing. Had two updates only, 2years back, to window 10 64bits Home edition and an Nvidia 660 GTX Graphic Card. This served me well until a month ago when I decided to go for a new DELL Gsink 27 inch Monitor. Costing me 480 pounds. My old system was too weak and way behind to be able to use it with acceptable FRS under load when using my highly advanced scenery addons. I had then to consider one of two options, either to buy an up to date system or have a further upgrade to my old system. I went for the first option. £2600 for a new system which was returned next day as it was over heating and with a very noisy fan. Researched and found that my old Asus Motherboard can take and work well with Zotac GeForce GTX 1070 Mini, 8GB GDDR5 VR Ready Graphics Card, 1920 Core, 1518MHz GPU, 1708MHz Boost	£269.94 . From Scan.CO.UK. 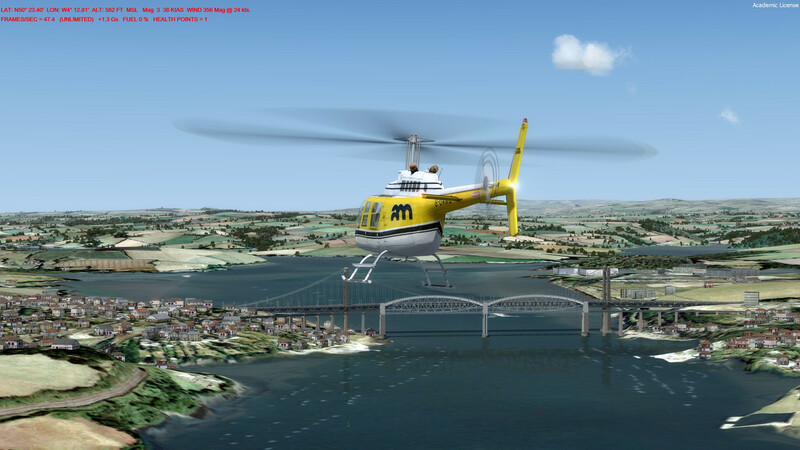 I am pleased to say that I am reasonably satisfied with this great graphic card which perform well with my P3D Version 4.4 heavily loaded with many scenery addons and flown at maximized sliders. 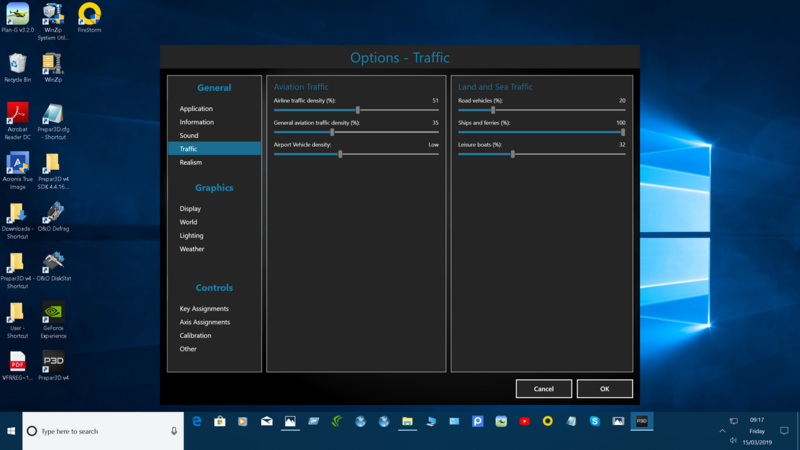 Frame rates ranging from upper thirties to only lower twenties in the most heavily demanding scenery addons like VFR France scenery and my cherished and incredibly good, Earth Simulations scenery addons. Please LM retain their backward compatibility in your future version of P3D V5 if at all possible. they are invaluable work of love ,courtesy of Darren and Vikki with valuable help given by George Davison, a member of these forums. Hope to post some screenshots soon and may be a short video. 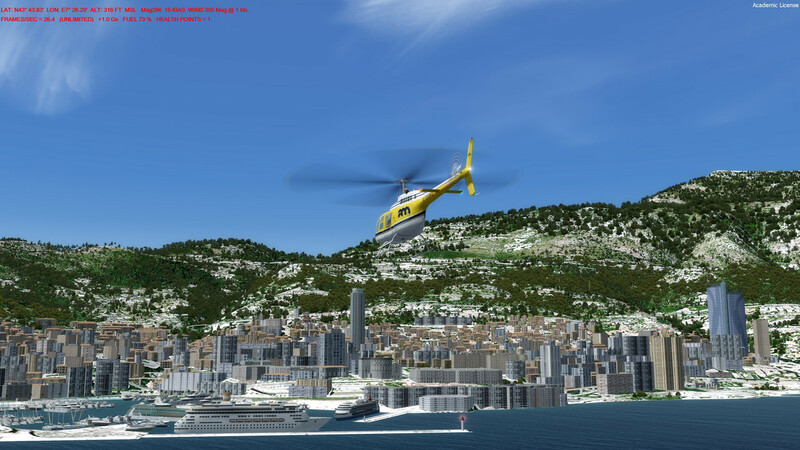 Just added a short heli ride over Monaco in the video section of the forum. Hope you enjoy watching or say what you think about the results. and this is how I have been monitoring my recent system upgrade . Helped by using my task manager. And this is how I have been monitoring my upgraded graphic card using Zotac FireStorm utility. letting the fan run manually at 100 speed is amazingly very quiet and the temperature does not go above 55 Celsius even in the most heavily loaded and demanding scenery add on. PS. 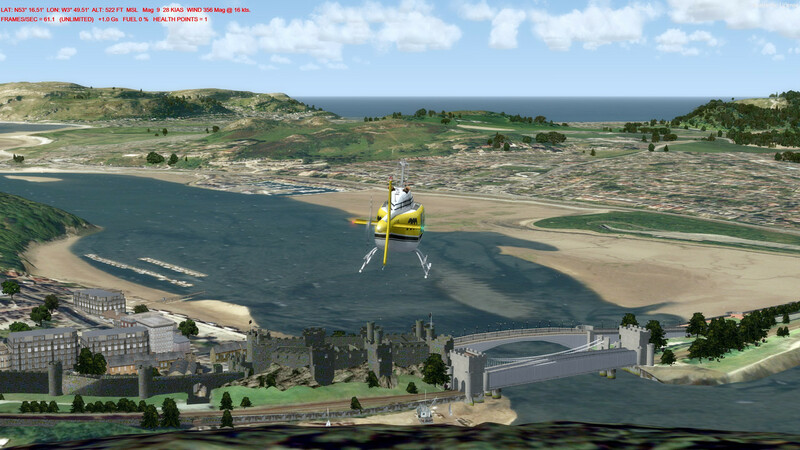 have a look at the video forum section, I also put a short flight video over UK Plymouth bridges. I'm interested in what are your P3D Graphic settings and slider positions Monir? I notice you don't seem to have any shadows? What is it like at dusk with HDR on? I guess you are running at 1920 x 1080 at 60hz or do you have a higher res monitor? 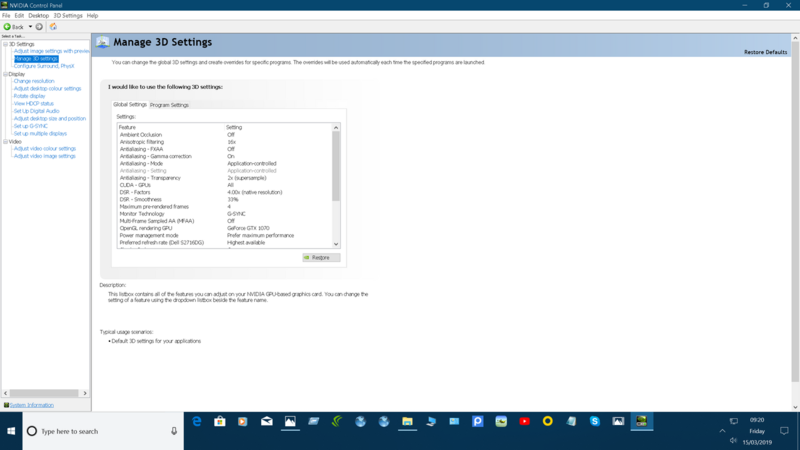 I have a GTX1070 myself on an older i5 system. 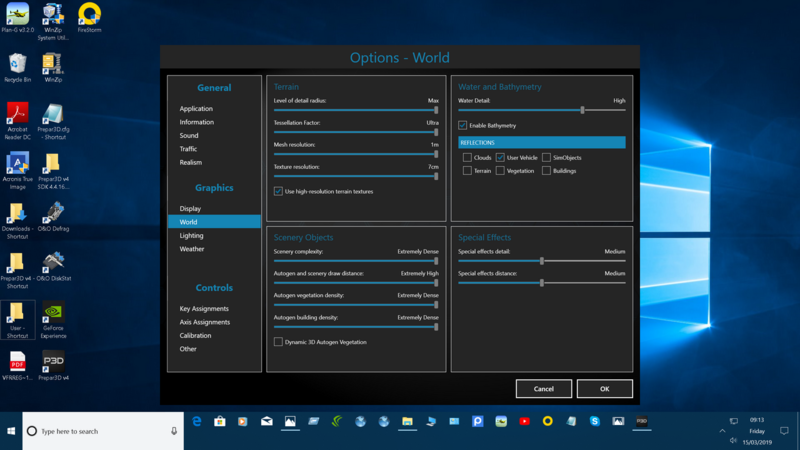 I hope LM will allow me to post in this important topic few more screen shots about my Sliders settings in my P3D V4.4, CFG settings Tweaks, Nvidia Control Panel settings and Gsink setting. My main monitor is: Dell S2716DG Quad HD LED Non-Touch Gaming Monitor, 27". Nvidia Gsink capable. Hope the screen shots will be of some help. Shadows works very well and flying at dusk is also great. My 10 years old Quad processor was the first Quad processor by Intel. Never attempted to overclock it as I do not know how. and never had to monitor its core temperature. I Think the Nvidia Graphic cards advances over the years are most important and more critical when considering an upgrade, only if your Mother board is compatible and you have already a powerful enough Power supply unit. I ONLY USE SHADOWS FOR THE AIRCRAFT. In the P3D V4.4 CFG , [Display] section I would go down to 12 instead of 18 in the Texture Max Load= , if you encounter minor statures. Posted screen shots in the screenshots forum . Some in the UK, some in California at Dusk and at night and some in south of France. Hope you enjoy watching and guessing the location of some of them. Sorry about previous screenshot empty posting which I was unable to edit in time. However now that the air is clear. I would like to thank Aussie for drawing my attention to the lack of shadows use in my posted screen shots and flight videos. using all shadows ticked is more realistic and have only a little hit on the frame rates. Using water reflection is also more realistic but has a more noticeable hit on the frame rates. I like shadows in flight sim and I am willing to sacrifice a few frames. I generally have all of the 'Receive' boxes ticked (apart from the last one) and only a few 'Cast' boxes. I like to see cloud shadows on the ground and moving over an airfield as you are preparing to fly. Makes a lot of difference in mountainous areas such as Queenstown. Mountain shadows on the water add realism. And 'particles' improves the depth perception in slightly overcast conditions. Makes the image more photogenic in my opinion. 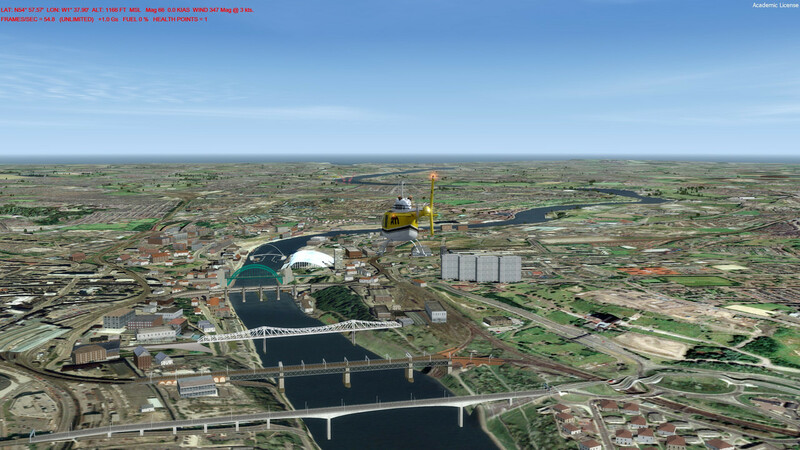 Its fun exploring and trying to balance the equipment you have, with P3d's capabilities. I agree with you Aussie, Its fun exploring and trying to balance the equipment one have, with P3D's capabilities. 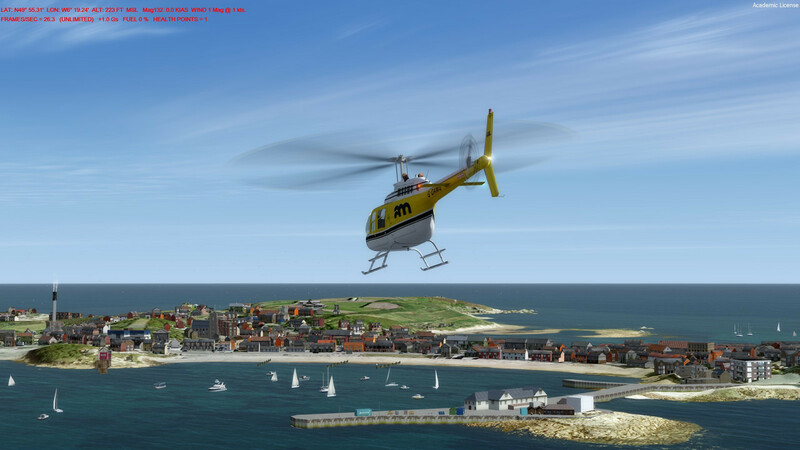 Finding the sweet spot only comes after the right tweaking of theP3D CFG, tweaking the Graphic card control panel and P3d options and sliders adjustments. I have been trying to assess the capability of my system by using extremely loaded and high definitions scenery I have, while running with Maxed settings. I need some help and clarifications if possible from anyone or LM Brady if possible. 1. My CPU under extreme load get only used totally 85% why or how can I make 100% use of my CPU? Core one get only 50% use, Core0, 2 and 3 get 90%use. 2. My DDR2 8GB Physical memory get only used 60% . Never more than 5 GB even under Extreme load? Why the other 3GB are not used ? is there a mandatory sharing portion ? 3. My graphic card get used up to 95 % but says 4GB out of its 8GB Memory is shared . ? shared with what.? Looked in the learning centre of P3D and became clearer about The No shadow Flagged Content and what are particles? However I still would appreciate any guidance or explanation as to why I am only getting the use only of 5 GB of my DDR2 memory out of the total 8 GB I have, even under maximum scenery load challenge. I am running with Window 10 . 64 bits Home Edition. The same with my Old Quad Core CPU, I am only getting Max Total use of 80% only also under maximum scenery load challenge. Any thing to do with The Affinity Mask =14 Tweak in P3D CFG ? I do not know which number to choose or try ? Is there any thing I can do to get the full use of those two valuable resources. Did my research on the internet by googling and found so many topics dealing with the same problems. 1:Does The CPU Cores use in P3D V4.4 Benefit from using the Affinity Map 14 Tweak to the P3D V4.4 CFG or it really does not need it any more. Most people say they are not using that tweak. I am now following in their steps but I did not notice any difference so far. I Hope that LM could really give an updated guidance on this one. 2: More use of my total 8GB OF DDR2 RAM. I followed the advice regarding the adjustment of virtual memory change of the total paging file size for all drives by clicking and doing the following steps: Control Panel/Advanced System settings/performance/Settings/Advanced/Virtual Memory change/The total paging file size for all drives Changed it from existing 8192 MB to the recommended 1960 MB and applied. I am still having only 5GB memory used out of the installed 8GB even under heavy scenery load . System check confirm that I have 8 GB Ram installed. All in all the updated very old system is still working well. Following the advice given to me earlier by Aussie , I am now running with some of my P3D sliders at the mid to high range only, but with good results and FRS. Are you still facing any issue? If so then please reply me back I have the best solution.